Earlier this year we talked about enabling business continuity for organizations across on-premises and cloud deployments. At Summit ’16, our annual user group conference, we shared details about how we were going to offer that and unveiled our plans for an on-premises deployment option for Microsoft Dynamics 365 for Operations (formerly Dynamics AX). Summit ’16 is a significant event for us as we get the opportunity to engage and hear directly from our customers and share with them the investments we are making to enable them to do more with our business applications. As part of this event, we announced some of the key investments we are making in Dynamics 365 for Operations that our customers can expect in the upcoming year. Specifically, we are strengthening the cloud-capabilities of Dynamics 365 for Operations including general availability in Microsoft’s two Canadian data centers. We shared the planned support of ExpressRoute for organizations that want better connectivity (higher bandwidth, lower latency) supported by a service level agreement for fast, reliable, and private connections. To enhance security, we are incorporating Azure Key Vault. And last, but not least, following the successful results of our new cloud onboarding service for Office 365 and Dynamics 365 for Sales, we have expanded our FastTrack offering to support Dynamics 365 for Operations. In addition to the above, we also shared details on how we are enabling business continuity for organizations that require on-premises solutions. While cloud services provide distinct benefits over on-premises deployments, we know that some customers require operational continuity in select business scenarios. For example, retailers must ensure that they will be able to run their store operations even if they lose connectivity for a few seconds. For these scenarios, we provide an in-store server, designed to operate with the simplicity of an appliance, to cache data locally and accelerate operations when the service is connected, provide for offline capture of transactions when it is not, to recover offline transactions through store and forward upon reconnection, and finally to provide for the connection of local hardware peripherals. This combination of a cloud system operating together with local hardware appliances provides an excellent synergy of capabilities and functions. There can be a variety of motivations that cause organizations to consider our supported on-premises or hybrid solutions including: 1) a conservative attitude towards cloud computing, 2) control of data, data residency, and data isolation, 3) dependency on extreme high availability of the service for business continuity (speed and connectivity), 4) ability to customize the configuration of the service infrastructure to meet specific business needs such as scalability, 5) recent investments in the company’s data center resources, and 6) choice of separating the service operator from the service provider to avoid lock-in by a single provider. To address these scenarios, we are pursuing a pragmatic approach that combines the best of both cloud and on-premises environments. 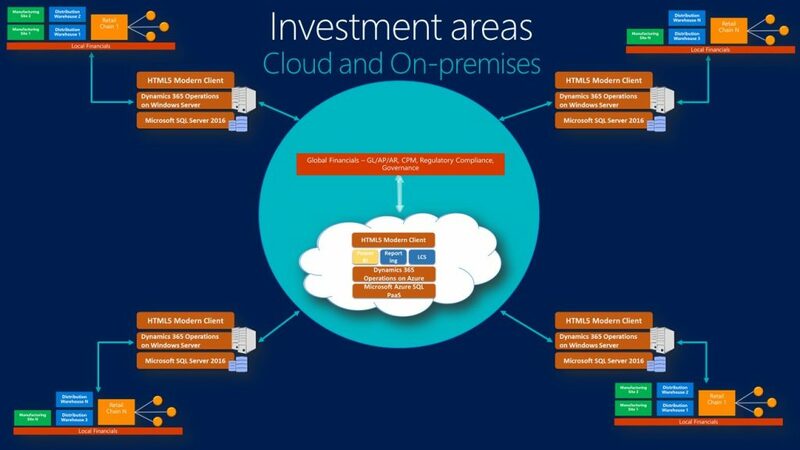 Dynamics 365 for Operations will enable organizations to run all their business processes on-premises connected to the cloud for a single view of the business across distributed on-premises environments, thereby providing on-premises support while utilizing the power of the cloud for intelligence in business processes. The cloud connection ensures data aggregation, financial reporting, intelligence, backup and disaster recovery and more. Let’s dive in deeper. First, we will enable organizations to support business-critical operations such as retail store, warehouse, and shop floor operations with local deployments in their own data centers. We then plan to expand that support to enable them to run their entire business operations on-premises. In this scenario, all transactions are captured and stored in the customer’s local system that is comprised of business application servers and database(s) running on the customer’s own infrastructure. To facilitate a distributed business environment with retail, shop floor or warehouse operations in multiple locations, organizations can scale through the deployment of multiple local on-premises systems. single view of the business and the ability to capitalize on synergies between the sites, it is essential to aggregate data in the Microsoft cloud to report and process financials and manage enterprise data centrally. The elastic compute power, artificial intelligence, and speed of innovation of the cloud enriches the on-premises systems in a way that would be very difficult to realize in a totally disconnected system. Example of how a Cloud Connected On-premise deployment is differentiated over a pure on-premise deployment: 1) back-ups of the on-premises systems can be maintained in the cloud for fast and easy disaster recovery. 2) Usage of machine learning services to analyze large volumes of data to provide recommendations to the users of the local systems. All cloud and on-premises deployments are managed by Microsoft Dynamics Lifecycle Services (LCS), including the automation of best practices deployments, which helps improve quality and lower the risks of implementations. And when it comes to using Dynamics 365 for Operations, regardless of a cloud or on-premises deployment, people across the organization have access to the data and business processes through a single, integrated, and improved user experience. This approach will substantially help our customers to scale in highly distributed environments while empowering people a single view of the business. The local on-premises deployments capitalize on the customer’s data center investments and ensure that extreme business continuity requirements are met. It also helps organizations meet data residency and compliance requirements more easily. At the same time, the customer can benefit from automated deployments and updates, telemetry, and intelligence that the cloud offers. This gives our customers the best of both on-premises and cloud worlds – and initial feedback from participants at Summit ‘16 has been overwhelmingly positive. The scenarios, described above, are coming soon! Support of on-premises retail store operations is coming in November 2016 and shop floor and warehouse operations are planned for the first half of calendar 2017. Support for all other business scenarios can be expected in the second half year of 2017. More information about our roadmap can be found online on this roadmap site. If you want to get started today, you can begin with a cloud implementation and transition to the new on-premises scenarios when available. One single implementation approach in LCS allows multiple deployment approaches – fully cloud; Cloud Connected on-premise, and the various possibilities. Stay tuned for more information on this topic in the coming weeks.